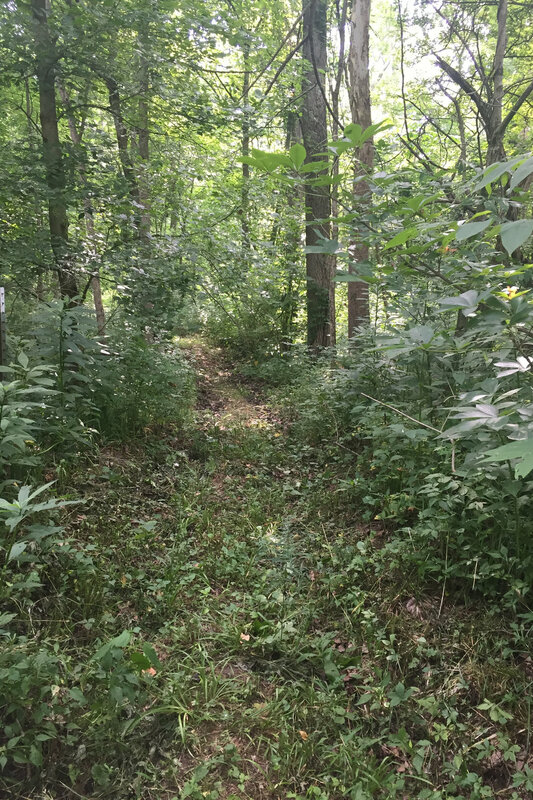 I am excited to tell you that my husband and I recently purchased some land in Wakeman, Ohio. We are currently building and will be moving in mid-March of 2019! We will be situated on beautiful 9 acres with wooded trails and access to the East branch of the Vermilion river. I will be hosting many events, classes, intensives, and herb walks in the near future. Check out the Events section of this website to learn more. Ancestral Herbology will also have its own office attached to the main living area where I can privately see my clients in consultations and provide an area to make medicine in class settings. I have been visiting the land and documenting the herbs, trees, and shrubs growing there; as well as, enjoying the peace and quiet in this natural setting. There are many great Sycamores, Oaks,Hawthorns, and Maples along with Paw Paw trees dominating these woods. Wildlife is abundant and the river lends its soothing voice. This is a place for my clients and students to feel nurtured and replenished, and where they can learn to sustainably harvest in the wild when appropriate. Those that wish to learn, can see firsthand how to make their own medicine while learning to connect with the plants. With this setting, I will be able to teach herbalism without having to leave the premises and I will have more hands-on training available for the students. I will also be looking to train apprentices in both natural and clinical settings. I am looking forward to meeting the residents of Wakeman and its surrounding areas and providing much needed training and other services to benefit the community. If you know someone interested in these classes and training; as well as needing personal consultations for their health, please have them connect with me here in the contact section. They can also visit my facebook page @MaryColvinClinicalHerbalist. I find myself toe-tapping Mother Nature to hurry up already and bring us new growth and warmer weather. However, Mother Nature is doing her job (just not as quickly as we would like)! Here, I find Motherwort (Leonurus cardiaca) doing quite well even with the cold. This is one particular herb that has come to me in my dreams. I never understood the implications until I met Pam Montgomery at the New England Women's Herb Conference. You could say I was just getting into herbalism and this was all new to me. She introduced me to a different way of connecting to the plants. I realized that Motherwort was reaching out to me in a way that I would understand. I dreamed that I was harvesting Motherwort across the street. It was the correct time of year to harvest the plant and I was doing it happily in my dream. When I woke up, I realized I still needed to harvest this plant and it was the perfect time to do so. I set out that morning with my alcohol, mason jar, and pruners and was able to get a nice tincture going. A few hours later, I looked out the window to see all of the plants (including Motherwort) being mowed down. It's a good thing I listened to the dream and the plant! There have been other dreams with this herb; as well as, other plants throughout the years. I try to write them down in a journal upon waking. Motherwort has been an ally for me personally as a relaxing nervine and regulator of the reproductive and endocrine system. I find this herb to be beneficial for grief, depression, and any energetic imbalance of the heart. It is also considered to be an excellent heart tonic especially with palpitations. It is cooling and drying as most nervines are and can be especially drying to an already dried constitution. In this case, I would use smaller doses or combine it with a moistening herb. It is very bitter and acrid so an infusion is difficult to get down sometimes. I prefer the tincture and suggest adding the drops to a small glass of water. Harvesting of Motherwort is usually done around August when the blooms are showing. I trim the herb including flower, leaves, and stem into my jar and fill it. Just be sure to have gloves because the flower spikes can be vicious! After filling the jar, I pour 100 proof vodka to the top and cap it off. I will label it and then let it sit for 3 weeks shaking it once daily. Strain and bottle the tincture afterwards (don't forget to label). I recommend up to 40 drops three times daily or 6ml a day if needed. Soon, we will see other familiar herbs beginning to bloom. In another week or two the Trilliums, Jack-in-the-pulpit, Wild geraniums, violets, bloodroot, toothworts, and spring beauties will be announcing Spring with bells and whistles! Keep your eyes peeled and enjoy the sight! It means warmer weather on the horizon!! Last year was super emotional for myself and my family. I am looking forward to a new year with new clients, new students, and new business associates. I have set many goals for myself and my business, but I wouldn't call them New Year's Resolutions. I would rather call them stepping stones! Hopefully, many of you are happy and well! We have had the Norovirus making its turn around the area, and I have to say it is a nasty one. Little did I know until recently that it was named originally the "Norwalk agent" from its origins in Norwalk, Ohio which is the next city over from me! My oldest daughter came down with it the day after Christmas. I wasn't near her that morning, but I was able to take over Dr. Christopher's recipe for nausea and vomiting that includes Turkey rhubarb, cloves, cinnamon, and spearmint. Bring one pint of water to a boil and then simmer a tablespoon each of the first three herbs in the water for five minutes. Pour this over 1/2 oz of spearmint leaves and let the infusion sit until it is cold. I strain it and then give 3 tablespoons every 20 minutes until the nausea and vomiting subside. This formula has never failed me and I make sure I have these herbs in my medicine cabinet. I then suggest Red raspberry leaves/blackberry leaves infusion 3-4 cups daily to help with the loose bowels afterwards. It is also a good idea to make sure you have plenty of fluids (once you can keep them down) and work with Echinacea or Elderberries to support your immune system. I recommend sitting in a tub of warm water if you can't keep the fluids down so your body can absorb the fluids through the skin. There's not much you can do except let the virus take its course; however, you can help shorten the duration, strengthen your immune system, and help improve the symptoms with herbs. I keep a constant supply of my own Fire Cider every winter to help boost the immune system and help the body fight the invaders. Get a mason jar and layer it with chopped garlic, chopped onions, chopped ginger root, chopped cayenne peppers (and seeds), a sliced orange, along with other spices such as oregano or thyme. Fill your jar with the chopped vegetables/fruit and pour organic apple cider vinegar over them to the top. You then want to cap it and label it with the date while you shake it daily for one month. At the end of the month, strain it and add 1/4 to 1/2 the amount of vinegar with local raw honey. Stir it completely and enjoy! I personally will take a shot glass a day. You can also take 3 of those daily if you are currently suffering from a cold, flu, or other virus. You can't see me, but I am raising my tea cup to you and toasting to a healthy, safe, and Happy New Year for all of us! For many people,"fall harvesting" means harvesting the fruit and vegetables from their gardens and preserving them for winter use. Myself, it means also harvesting my medicine and preparing for the winter viruses and bacterial invaders. Fall time is for strengthening our immunity and settling down for the colder months here in the Northern states. Before I harvest my medicine, I write down the herbs I am looking for. Then, I decide where I will harvest them from. Every herbalist has their favorite spots to wild craft (or harvest wild medicine) from. Some have their own herbs growing in their gardens, or have them growing somewhere wild on their property, and have no need to venture elsewhere to get them. Some herbalists prefer to buy their herbs from others because of environmental differences, lack of time, they need it quickly, or simply for convenience. No matter how the herb is collected, it is a good idea to make your own medicine for yourself and your family. It saves money, helps with preventing sickness, and requires very little time to prepare. It is best to research any herb you plan to use thoroughly and learn how to properly identify it before harvesting yourself. This includes what parts to harvest, how they are used, what contraindications do they have, and how best to prepare them. This time of year is for root and bark harvesting. You can also collect and harvest some fall fruit for medicine. Once the plant dies back for the winter, the energy falls back into the earth and into the roots to sustain the plant until next spring. Bark can be harvested either in the spring when the sap climbs into the branches, or the fall when it flows back down. Because I missed harvesting the bark from a few trees in the spring, I will include them on my list for the fall. It is best to follow sustainability practices when harvesting roots because you are essentially killing that particular plant. Please be sure to plant the seeds from the plant before taking the roots. Another practice is to only take the root when there are plenty of plants around. You don't want to take the only one, or decimate a grouping of plants. Also, be sure to only take what you need. Once you have your list, know where you are harvesting your plants from, and have sustainability practices in mind, it is time to gather your medicine. Here are the herbs on my list: Echinacea (Echinacea purpurea) root, Teasel (Dipsacus fullonum) root, Marshmallow (Althaea thapsus) root, Mullein (Verbascum thapsus) root, Tulip poplar (Liriodendron tulipifera) bark, Dandelion (Taraxacum officinale) root, Burdock (Arctium minor) root, Yellow Dock (Rumex crispus) root, Sumac (Rhus glabra) bark, Rose hips (Rosa sp. ), and Crampbark (Viburnum opulus). There is a picture of my harvested echinacea roots above. I first cleaned those roots and then chopped them to add to my tinctures, glycerites (with vegetable glycerine), or oxymels (with apple cider vinegar and honey). I then saved some for drying to be powdered for capsules for my family (I have one that would much rather take the medicine in this form). First, have a mason jar cleaned and ready with a lid. Fill the jar with the freshly dug and chopped up echinacea root and make sure you pack it to the top. Then pour in your grain alcohol (190 proof) and fill 3/4 full. Add distilled water to top it off (fill to the top). This roughly equals 75% alcohol and 25% distilled water added as the extract. Or, you can use 100 proof vodka (which equals 50% alcohol and 50% water) and fill the jar to the top. Cap the jar, label the jar with the contents and date, and leave it sit on the counter to macerate for 3 weeks. Shake it daily. Strain after the three weeks and pour it into a dark bottle. Make sure you label this as well! I store mine in a cool dark area. I use drop doses as a preventative in 7-10 drops three times daily when an active virus/flu is near. If sickness has hit, I use 30 drops up to 5 times a day for a few days until the sickness abates. Take the time to research each herb and make use of the plants around you to make medicine from your own "fall harvest". Enjoy your bounty and I wish you good health through the coming winter!